where arg is the complex argument function. When φ(t) is constrained to its principal value, either the interval (-π, π] or [0, 2π), it is called wrapped phase. Otherwise it is called unwrapped phase, which is a continuous function of argument t, assuming sa(t) is a continuous function of t. Unless otherwise indicated, the continuous form should be inferred. In this simple sinusoidal example, the constant θ is also commonly referred to as phase or phase offset. φ(t) is a function of time; θ is not. In the next example, we also see that the phase offset of a real-valued sinusoid is ambiguous unless a reference (sin or cos) is specified. φ(t) is unambiguously defined. In both examples the local maxima of s(t) correspond to φ(t) = 2πN for integer values of N. This has applications in the field of computer vision. where φ(t) must be the unwrapped instantaneous phase angle. If φ(t) is wrapped, discontinuities in φ(t) will result in dirac delta impulses in f(t). This instantaneous frequency, ω(t), can be derived directly from the real and imaginary parts of sa(t), instead of the complex arg without concern of phase unwrapping. 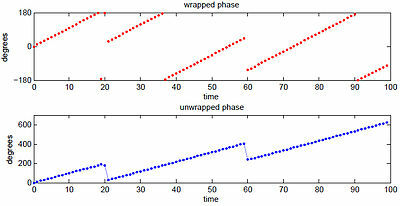 This representation is similar to the wrapped phase representation in that it does not distinguish between multiples of 2π in the phase, but similar to the unwrapped phase representation since it is continuous. A vector-average phase can be obtained as the arg of the sum of the complex numbers without concern about wrap-around. ^ Blackledge, Jonathan M. (2006). Digital Signal Processing: Mathematical and Computational Methods, Software Development and Applications (2 ed.). Woodhead Publishing. p. 134. ISBN 1904275265. ^ Wang, S. (2014). "An Improved Quality Guided Phase Unwrapping Method and Its Applications to MRI". Progress in Electromagnetics Research-PIER. 145: 273–286. Cohen, Leon (1995). Time-Frequency Analysis. Prentice Hall. Granlund; Knutsson (1995). Signal Processing for Computer Vision. Kluwer Academic Publishers.